Interview and show preview Asbury Park, NJ at House of Independents on Aug 24 2017. VICE: "We Talked to Artists About How Sobering Up Changed Their Work"
Dave talks about Philly and Bury Me In Philly in this interview in The Columbia Daily Tribune. 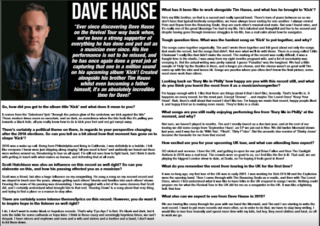 "Philadelphia freedom: Dave Hause increasingly comfortable in singer-songwriter skin"
"Singer-Songwriter-Genie DAVE HAUSE im TourTalk-Interview"
"The one thing you will never find is me writing about the leader of America. These are my songs, and I want them to last even after he is gone." Interview (German) done in Zürich on 03 October 2017, one day after the Las Vegas shooting and Tom Petty´s death. Not the best translation but it captures Dave´s (and the band´s) mood. They all seemed to be sad and tired at the show that evening. I was pleasantly surprised to see everyone in a good mood with great energy in Vienna on the following day. The show must go on. Here is a German interview from March 2017 about Dave´s tattoos and their stories. I´m sure I´ve read this a few months ago. Not sure why I didn´t post it here. Maybe because it´s in German. New interview by Jim Ryan "about working class artists, the role of the artist in divisive times and the power of music to bring people together"
New interview (German) in the current issue of FUZE Magazine! "„Kick“ .... der beste Release von Dave Hause." "Dave Hause enjoys his rock ‘n’ roll hybrid life"
" Dave Hause on fatherhood, family, and his suicidally optimistic new album “Kick” "
There´s a full-page interview (German) with Dave about the "survival guide" Kick in the current issue of Ox-Fanzine.